I am not one to spend time in foreign currency, but a friend of mine recently commented on the pending re-evaluation (RV) of the Iraqi Dinar (IQD). I’ve spent MUCH time learning the activities taking place in Iraq, but I’ve never paid much attention to the currency value. A simple Google query showed the Dinar currently trades at 1,160 Dinars to every $1.00 US Dollar. In laymen terms this means that each Iraqi Dinar is worth only $0.00085 US Dollars. Now consider the Dinar for investment purposes, for every $1,000 US dollars you can obtain 1 Million Iraqi Dinar. 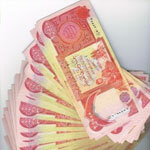 Having 1 Million Iraqi Dinar means little when each dinar equals only $0.00085 US Dollars. But what happens if the Dinar returns to it’s Pre-War (Operation Iraqi Freedom) value? In the 1930’s when the Dinar was still connected to the British pound it valued as high as $4.86 US dollars. As recently as 1988 each Iraqi Dinar was worth $3.22 US dollars. Coming into the 90’s the Dinar was still well over $1.00 US dollar. While it’s highly unlikely the Dinar will ever see these values again, It seems VERY likely to at least reach $1.00 US dollar as the country stabilizes. The US has a direct vested interest in ensuring the success of the new Iraqi government. Maliki has been made PM and 39 of his 42 cabinet members have been approved (I’ve read rumors that 2 of those 3 remaining seats have now been chosen as well). A Re-Evaluation WILL occur, it’s just a matter of when. A full government must be in place & a budget must be approved for parliament before an RV can occur, but it appears the seats are being expedited and the budget is finished and must now simply be read 3 times to gain approval. Speculation of the Iraqi Dinar Re-Evaluation has floated for years, every since it’s decline, So the question is: Once all of Iraq’s ducks are in a row, won’t they once again wish to trade as one of the wealthiest countries in the world and is it even remotely possible that the Dinar would trade at less than 1:1? Um, it’s 2014 and still nothing has happened. I have not lost faith, Iraq HAS to re-value if they expect to do any foreign trade…so, we simply hang in there.